The Convention rocked this past week. 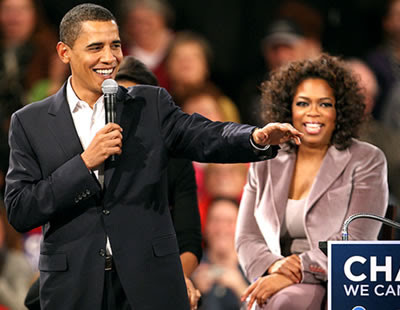 Oprah made a discreet appearance in a sky box at the stadium in Denver last night to see him accept the Democratic nomination. Earlier in the week at the Pepsi Center, Hillary and Bill gave great speeches after Michelle Obama kicked off the week before a surprising appearance and speech by Teddy Kennedy. For those of you that missed Clinton's speech, you can watch it below. It was the best of her career. Rock it out, Hills.